People call this Rollerblading but, Rollerblade™ is a brand name. Inline skating is what we do with RollerbladesTM or K2TM brand skates. Inline Speed Skating is what we do when we go f-a-s-t. I am a good instructor in that I can immediately assess what you must do, what you are doing right and where you need to improve. Call me, let’s get rolling. 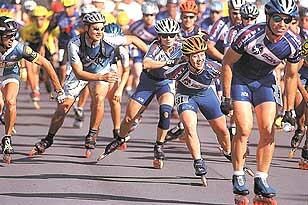 Inline skating began in the 1980’s. Two brothers from Minnesota that iced skated decided to redesign the roller skate (quads) so they could train for hockey in the summer. They added the brake on the back and added wheels so they could skate on it as they did on ice, but on the streets. Out of that came the modern inline skates. 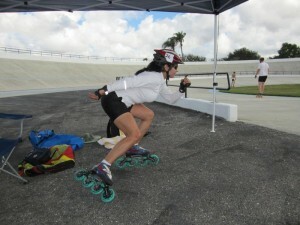 Inline skate brands like Bont, Simmons (made in America), and K2 are as commonly known to speed skaters as sneakers lines are well known to runners. We hope to get to the Olympics. 2024 here we come! If you need help buying a pair of skates call me. Are you buying for recreational or speed skating? I suggest you get skates that fits you well and are comfortable. There is nothing worst than dressing up with all your gear, driving out to skate, to find that your skates don’t feel good and they hurt your feet! 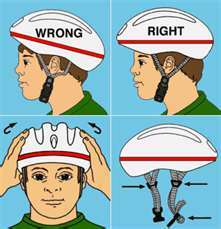 I suggest you start with 90mm. If money is no object, get 100mm wheels. You will enjoy skating more as the wheels and bearing will be of better quality and you will glide better. Most important you will keep doing the sport. (Smaller wheels (under 76mm) are great for doing tricks). Make sure you try them out on carpet and roll some before as you may want to return them. Never buy bigger sized skates. If someone bought you a bigger pair, and they are half size bigger use 2 pairs of socks to take up some of the space. It would be best to exchange them! For kids, check skates that expand as the child grows. If you are 4 to 80 yrs old you can skate! See stats that Basketball has more injuries than skating! Are you sad, depressed? Skate!